Leg 2 of the VS Gaming Overwatch league has finally come to a climactic end, but not without one final week of excitement. The culmination of the league saw the top three premier division teams battle it out for the laurels. Meanwhile first division also had an exciting end to the leg, as two undefeated teams bashed heads on the final day. Leg 2 was an eventful one that saw Premier team NovaEx unexpectedly retired midway through, forfeiting the rest of their matches. We also had the introduction of a new hero in the final weeks in Brigitte, who came out swinging and forced teams to either adapt to the new meta or get crushed by an unstoppable death ball. Leg 2 was described by White Rabbit Gaming’s Christopher “Thebarnical” England as, “The most intense and tight competition in VS Gaming history”. Going into Leg 2 White Rabbit Gaming (WRG) Boostios, the undefeated winners of the first leg, were heavy favourites to win Premier Division. Unbeknownst to them, there lay in waiting a Goliath, poised to strike. Mid-log contenders Goliath Gaming (GG) were looking to step it up a notch and take the fight to the top two giants, but it would not be an easy road as the reigning champions of 2017, Energy eSports (eN), were also hungry to reclaim their title. The start of the leg saw a dominant performance from the top three as neither team looked like they were going to be deterred from taking the top spot. WRG and eN had a fairly easy two weeks, managing to show total dominance in all of the games they played. GG, on the other hand, spent those first two weeks fighting hard battles, nonetheless emerging undefeated. It was not until midway through week three that the leg really started to get intense as the three undefeated teams would finally face each other. GG took on WRG right after the meta change and, due to several complications for GG, were not as practised with the new meta as WRG were. It showed in their game and GG suffered their first loss. This loss, however, did little to dishearten them as they came back firing in week four against eN. Goliath Gaming’s Alastair “Lag_Beast” Bearman had this to say on the game. GG managed to use the new meta to great effect against eN, leaving WRG as the only remaining undefeated team in Premier Division. It now fell entirely on eN to dispute the undisputed. WRG, who had remained undefeated since the start of the first leg, had high hopes finishing the second leg with seven wins and zero losses. TheBarnical describes his team as being, “Amped going into the match vs eN and curious to see how [their opponents] had adapted to the new meta”. Energy eSport’s Michael “Arturia” Brazer (eN) describes opposite emotions in the eN camp, explaining that they were feeling demotivated due to their loss to GG two days earlier. He claims that it was only due to the support and motivation of their newly retired captain, Marthinus “CarNage” Strydom, that they were able to push forward and show WRG what eN can do. The penultimate game of the leg was nothing short of phenomenal, as both teams refused to back down. eN managed to secure the first two maps, leading the game 2-0. However, WRG rallied together and gloriously fought back taking maps 3 and 4, leaving it up to the final map to decide the outcome. In the end, eN came out on top, and as the undefeated titan fell to the ground it was unsure who would take the log. WRG still had a game in hand and were strong favourites to take it all. 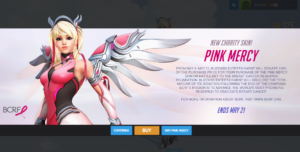 The BCRF Mercy skin is an amazing cause to support. Go get it, now. As the final day of the leg came to a close, eN took the top spot, beating WRG in win percentage by a mere 1.56%. GG had high hopes of taking second place away from WRG. But, due to their defeat in to their head-to-head clash, came third. When the dust settled on the prem log not much could separate these teams. As a calm descended upon the ranks of the Prem division, it was Pulse Gaming’s HappyTreeFriends’ turn to drop the news that they were retiring. Some of the players had decided to retire from competitive Overwatch indefinitely. Only time will tell if they will grace the VS Gaming scene again. The retiring of NovaEx and Pulse, as sad as it is, had little effect on the log. Both teams were set to be relegated to first division for the start of leg three. First division wasn’t without its fair share of action and upsets as newcomers to the division, Kronic Underdogs, started out the leg with possibly one of the biggest upsets of the division. Underdogs took on OG Ominence, previously a Premier division team. The newcomers beat them 3-1 and it set the stage for it to be a strong leg for them. But as Ominence fell off the radar, two other teams would rise up to show us their mettle. Ex-prem team, Phoenix Rising, were aiming to get back into the prem division as Prodigy had their eyes set on taking the top spot. Prodigy’s win over Phoenix Rising secured an outright first division victory, however both teams will be moving into Premier Division next leg and will be looking to make quite an impact. On the bottom side of the log, MCMC and NM. Validus will be headed back to the ladder where they will have a chance to rethink their strategies and hopefully come back to first division in the future ready to fight for the top. Also, with Prodigy and Phoenix Rising being promoted, and the retiring of NovaEx and Pulse, we predict there to be four newcomers to the first division log next leg. It is going to be great to see how these teams take on the challenge that is the VSG Overwatch league. With all the changes taking place over the transfer season leg three looks to be as exciting as leg two. As the new meta is drilled into the minds of the players, time alone will tell who is going to win the day. 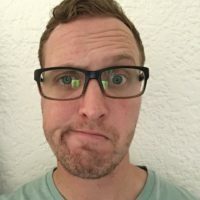 Jayson “Trinoc” van Kerckhoven is a self proclaimed writer, streamer, and esports caster who spends way too many hours of his life searching for meaning in Overwatch stats.